Saturday, April 16, 15 members of the Potato Creek Bassmasters held our April tournament at Lake Lanier. James Beasley won with 9.95 pounds, Lee Hancock placed second with 9.60 pounds, Pete Peterson came in third with 9.18 pounds and Mike Cox was fourth with 7.34 pounds and had big fish with a 4.27 pound spot. It was a very frustrating day for me. 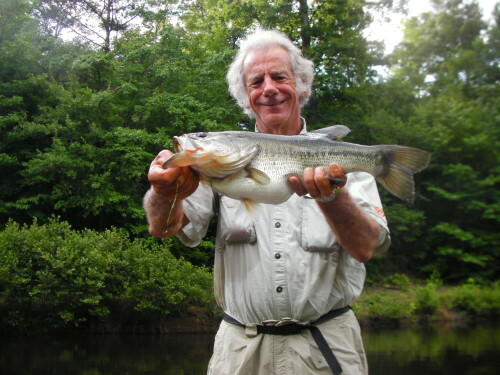 I had been seeking pictures on Facebook of a lot of big spotted bass being caught at Lanier and some of the guides were saying they were shallow and on a predictable pattern and easy to catch. Kwong Yu fished with me and we started on a rocky island, the kind of place I had been reading about and also a place where I had caught some three pounds spots this time of year. Everything seemed perfect, with a little wind blowing in on the rocks, and we tried a variety of baits but had only one short strike there. We tried a couple of more places that I like to fish and Kwong got a good keeper on a jig and pig. I missed one on a spinnerbait. But after three hours we had only one bass in the boat. Kwong suggested a place down the Lake and we went there, but one arm of the creek was unfishable due to the wind blowing into it. The other arm was more protected and I managed to catch a keeper spot on a Carolina rigged lizard. And we both caught some spots shorter than the 14 inch limit. With about an hour left to fish we went to some docks near the weigh-in site. Kwong fishes them a lot but I don’t usually fish there. I caught a 2.5 pound spot on a jig head worm from one of them, and we caught some more throwbacks, but that was it for the day. Two keepers weighing a little over four pounds in eight hours was not what I expected at Lanier. I had heard the best bait was a Rapala Wake Bait, a new version of an old bait, but I didn’t have any. I went by Berry’s Monday and they have ordered some. I just have to have the hot bait, even if the hot bait will be something else next week! Fishing this spring has been unusual, just like it is every spring. It seems like the weather swapped for April and March, with warmer weather in March than so far in April. That is one thing that keeps fishing so interesting and frustrating, the only thing that is consistent about fishing is it is inconsistent! This entry was posted in Bass Fishing, Tournament Fishing on February 6, 2019 by ronniegarrison.